As it turned out, I would make two trips during the same week to find out as much as I could about this colorful Taoist temple operated by the Camau Association of America, a “local benevolent, cultural and religious association primarily directed at and associated with the local Vietnamese refugees from Camau Province of Vietnam.” It was once the location of a Christian church, which was purchased in the 1980s and transformed into a Taoist temple that was finished in 2005 and dedicated the following year. 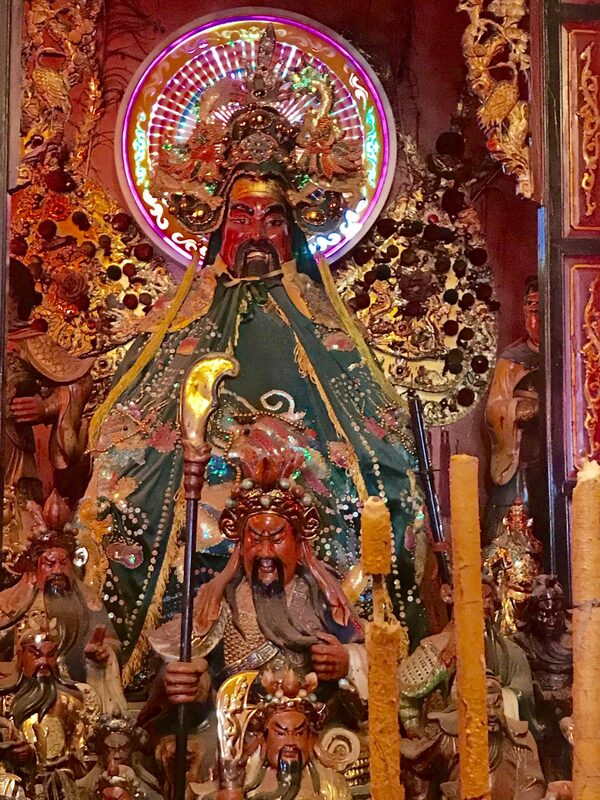 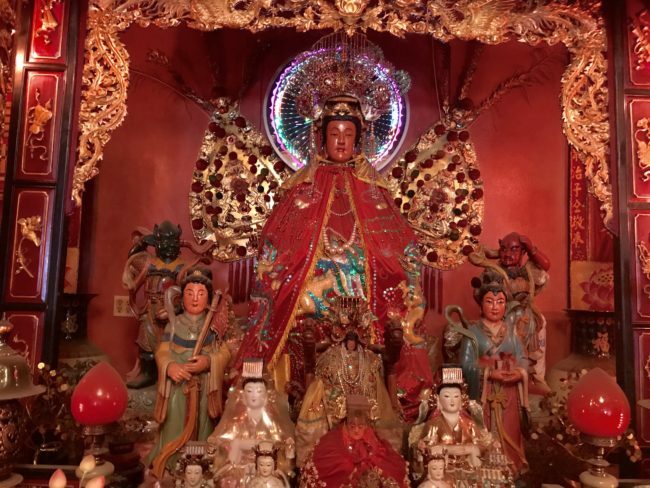 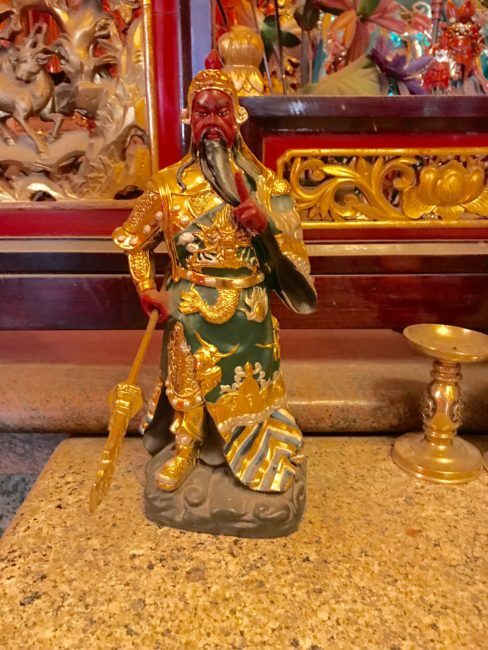 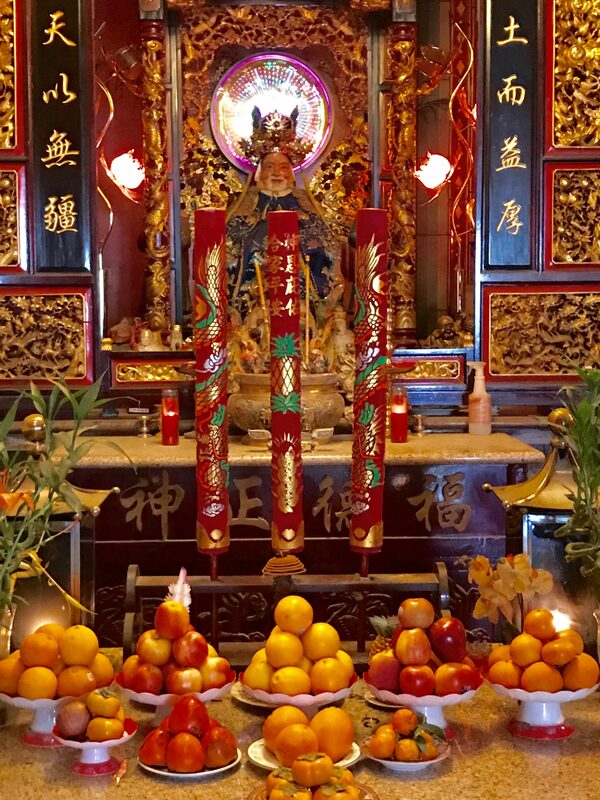 I had learned before I visited that Thien Hau Temple (Chua Ba Thien Hau in Vietnamese and as Tian Hou Gong in Chinese) is dedicated to Mazu, the Taoist goddess of the sea. 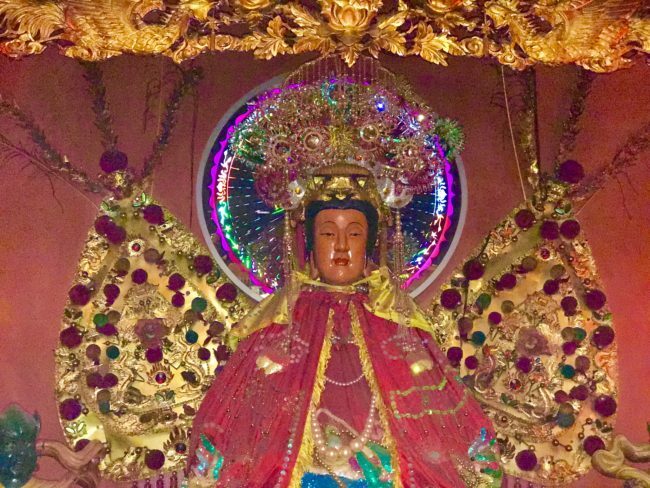 She was the patron saint to sailors, fishermen, and to those whose cultures are associated with the sea. 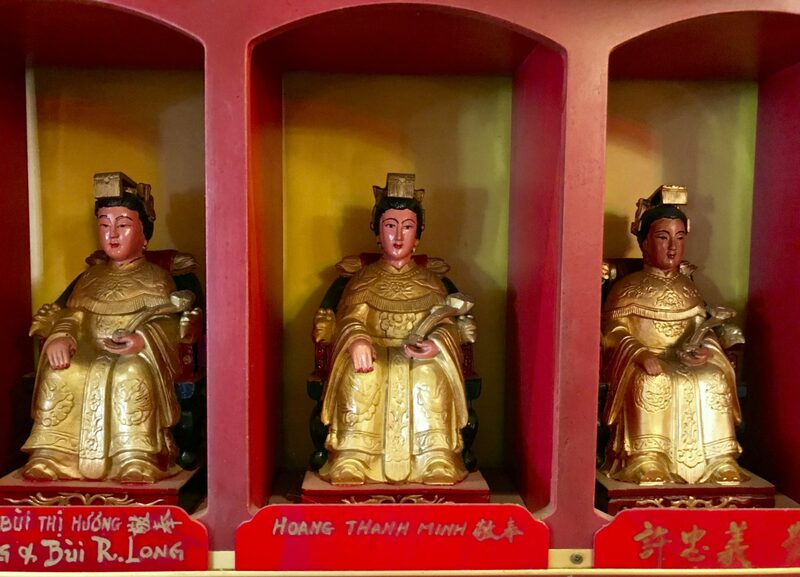 There are a few other important gods that are also worshipped here, too. I’ll get to all of them. 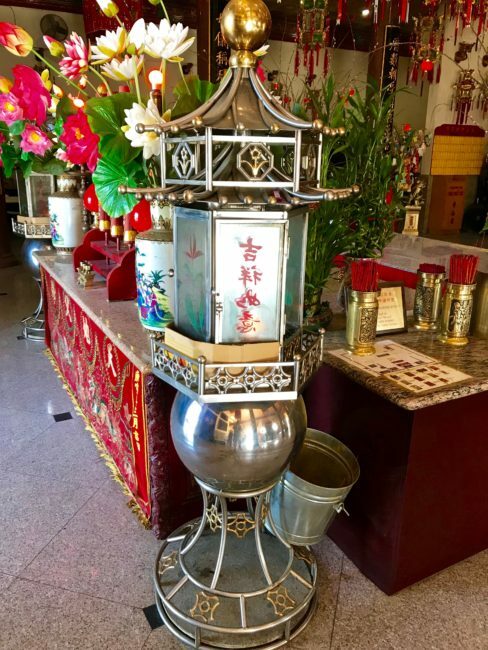 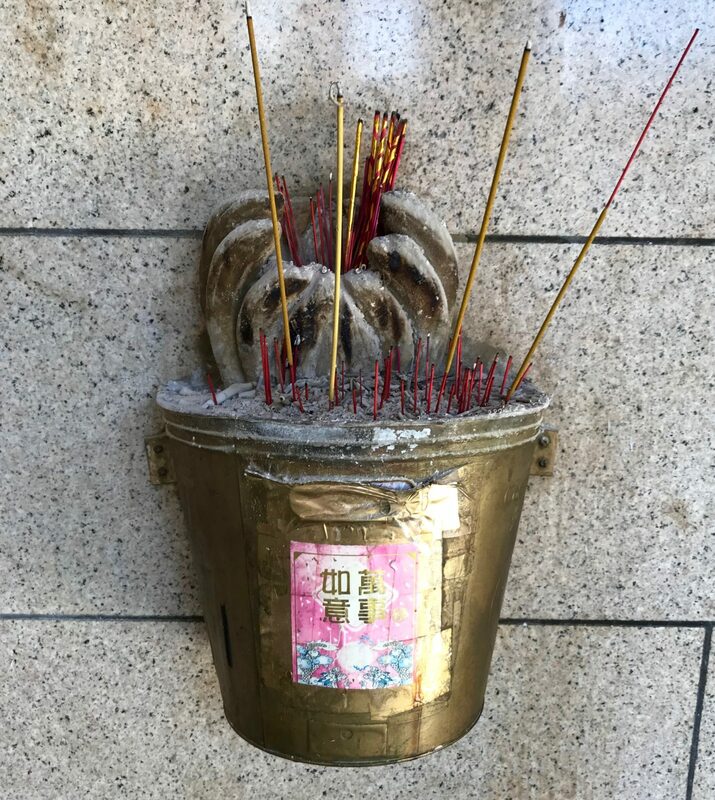 As I approached, I saw a woman exiting the temple holding a bunch of sticks lit at one end (burning incense…no peppermints), and she walked to what I perceived to be a shrine at the front of the building. 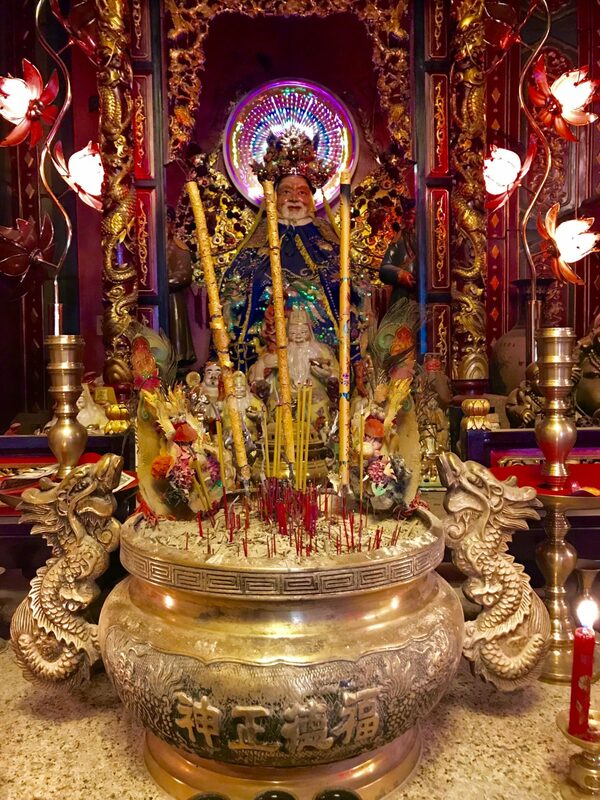 After a moment of reflection, she put the lighted end of the stick into the stand and moved on. 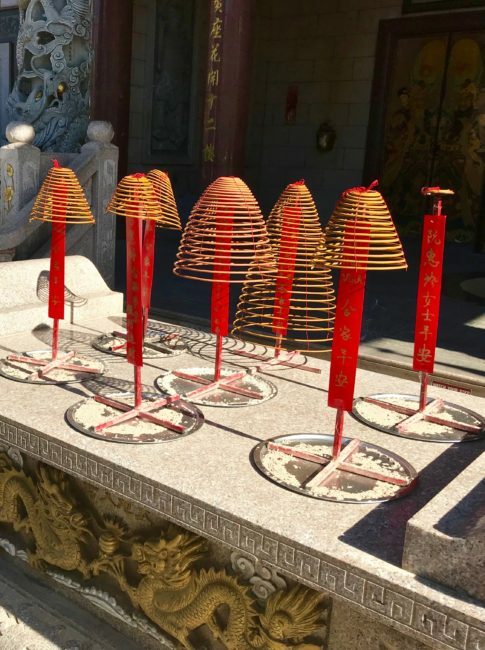 I would learn later a little bit about what she was doing. 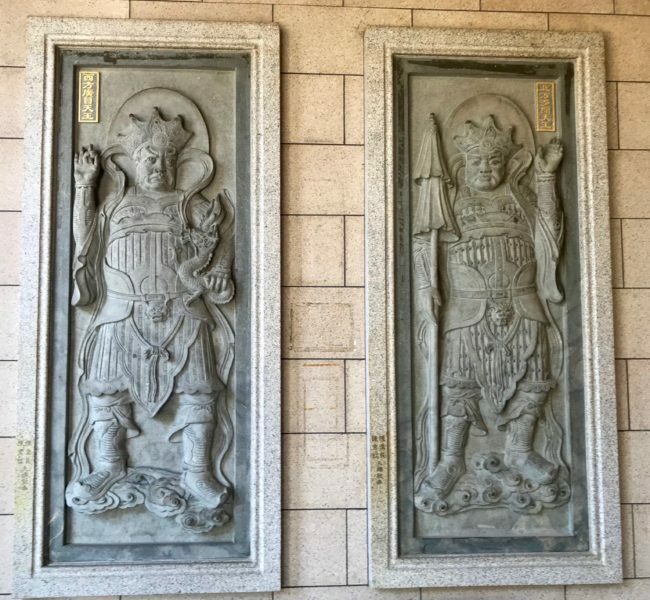 At the moment, I was more interested in the enchanting and enticing exterior of the building, which included some dragons and what looked like a crypt with some funky decorations on top. 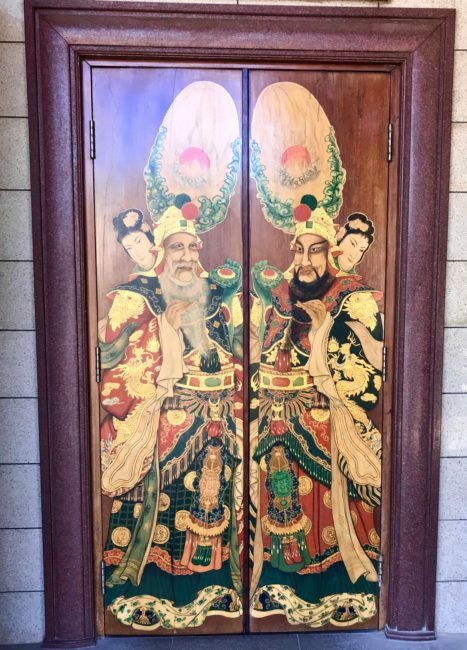 On either side of the front doors are two beautiful, painted doors. 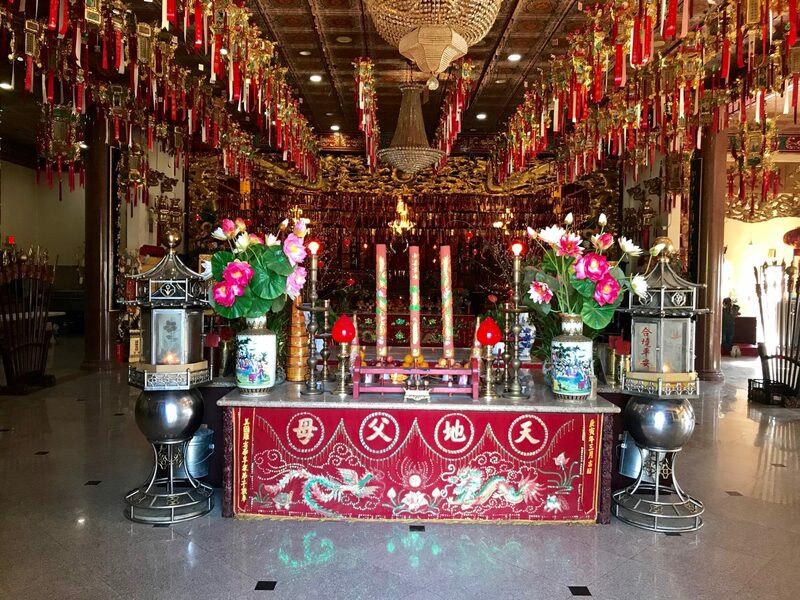 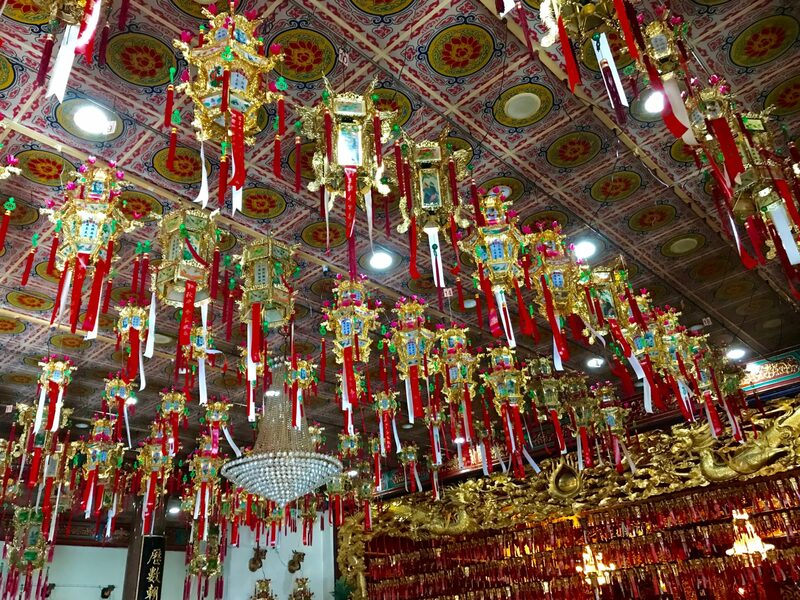 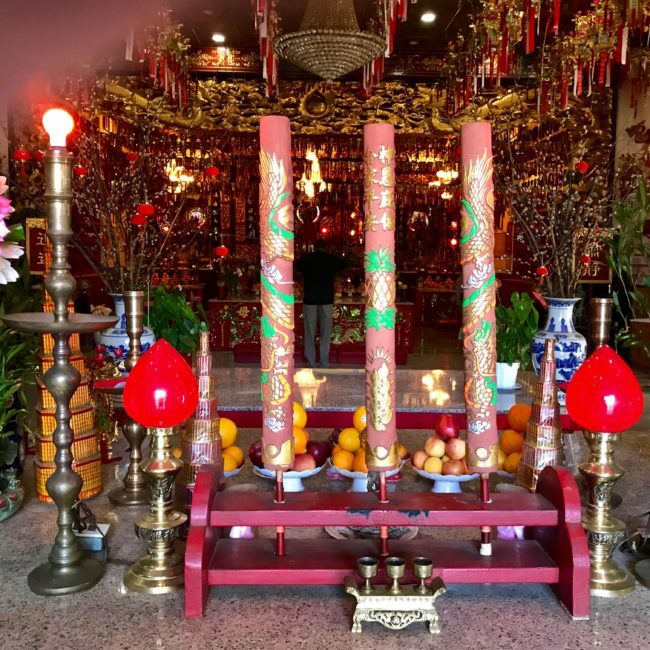 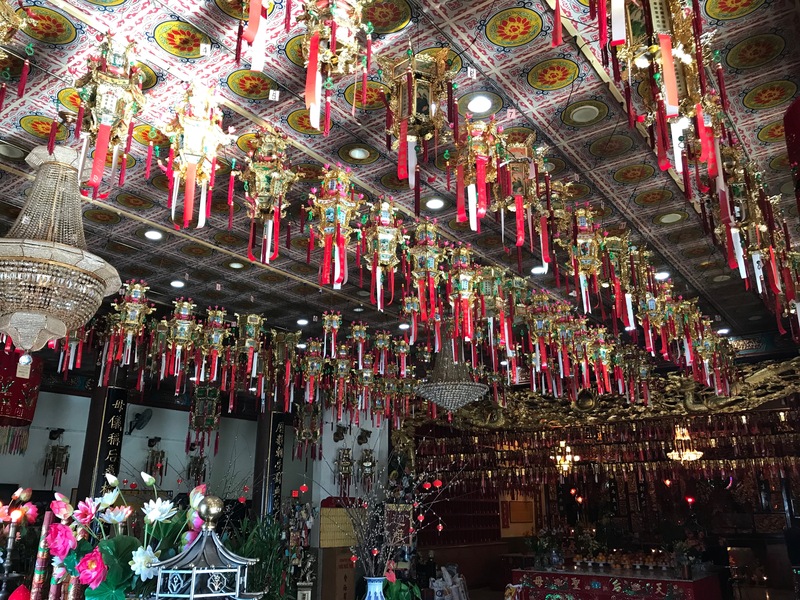 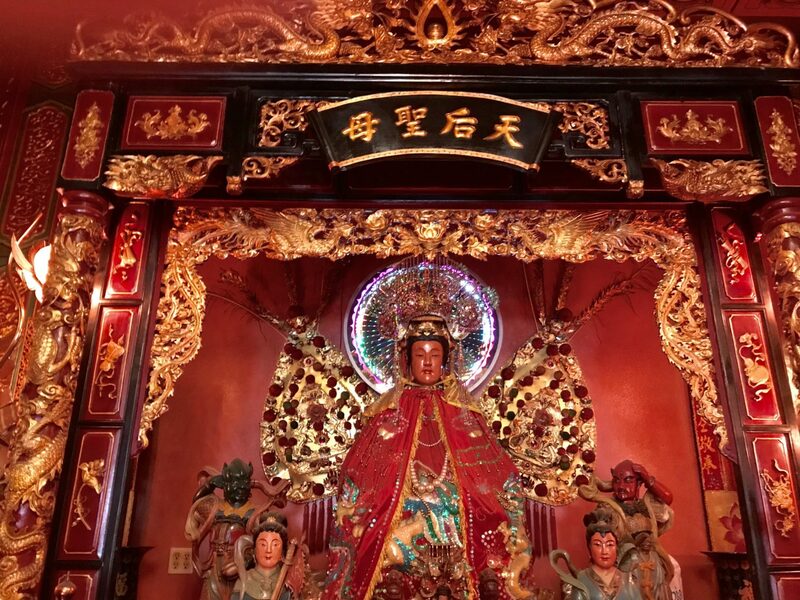 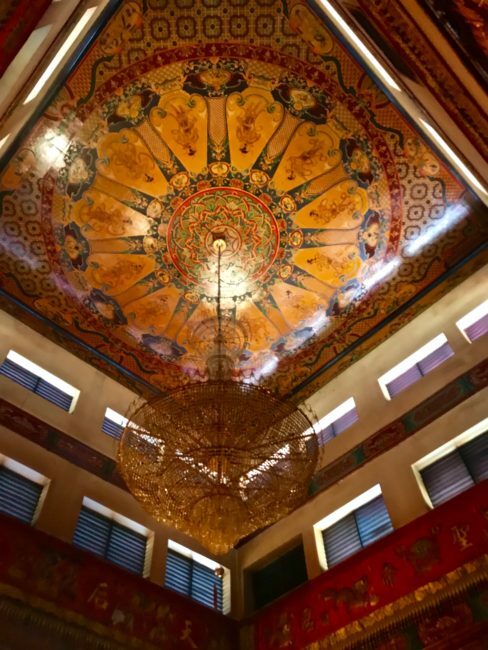 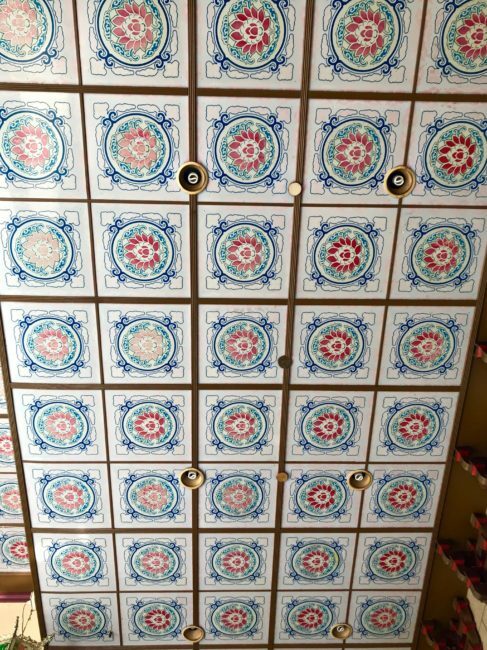 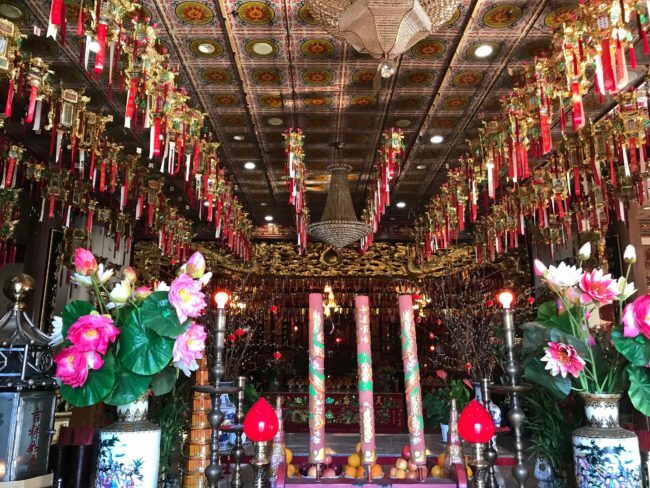 Walking inside Thien Hau Temple is definitely a “Wow” experience. 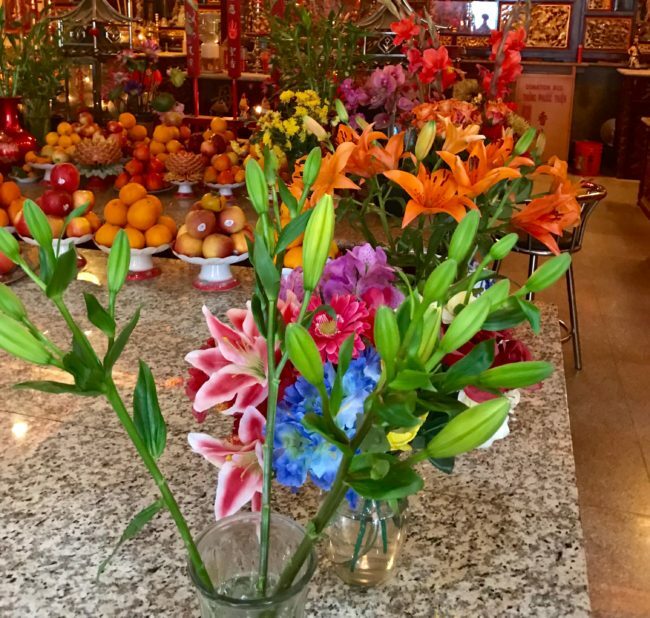 The colors consume you, while lanterns, candles, flowers and fruit overwhelm your senses at every turn. 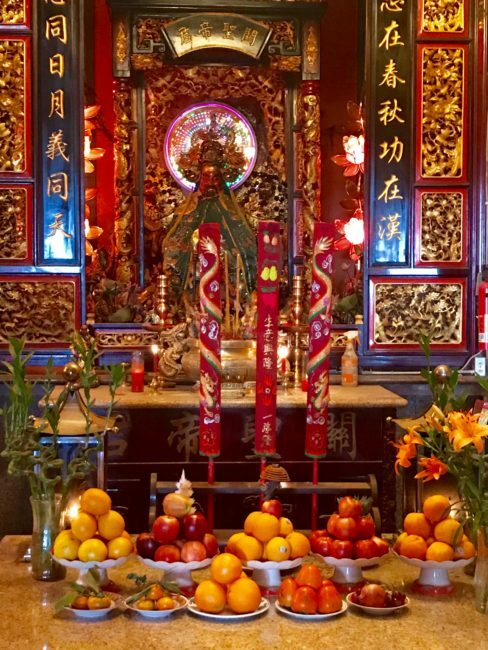 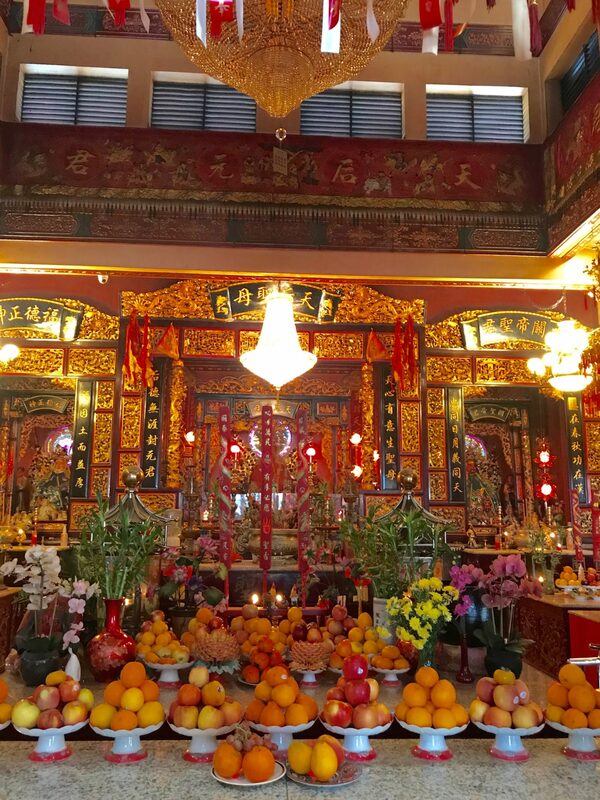 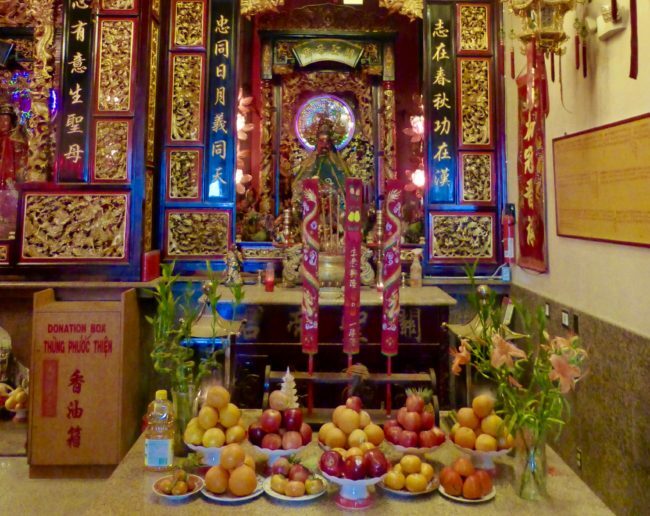 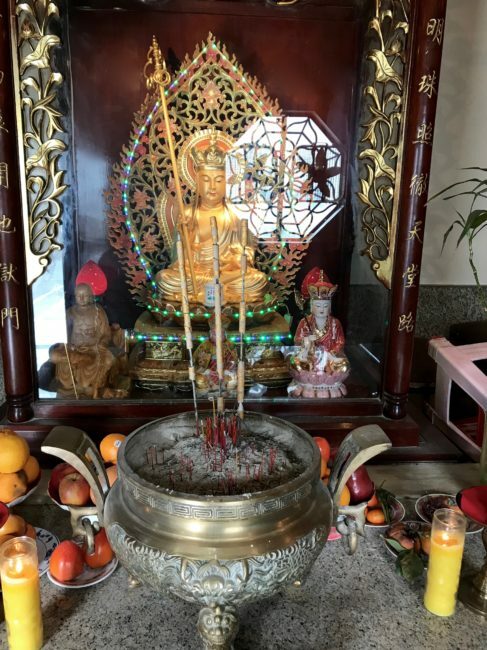 As we gazed at the abundance of fruit and flowers that lay before us, Michael explained that these were gifts of gratitude for Mazu, whose shrine was up front along with a couple of others. She has two Guardian Generals, one on either side, to keep her company. 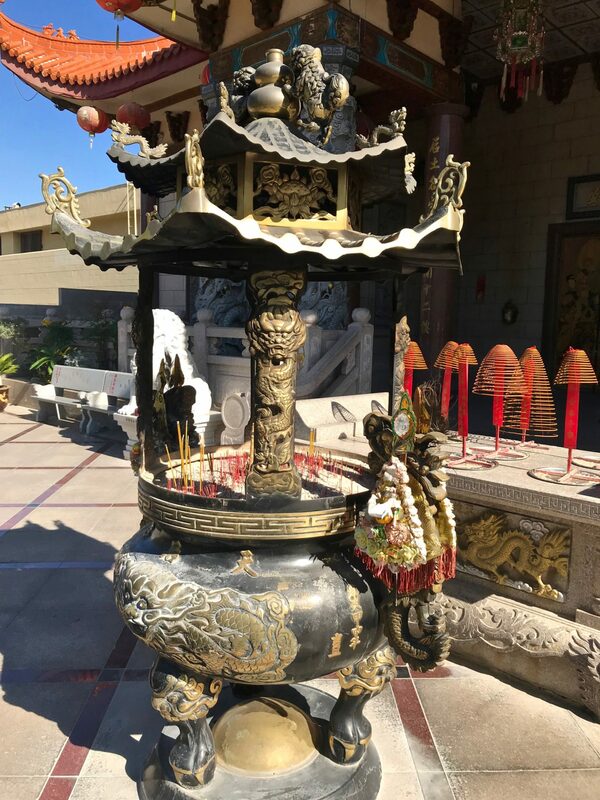 There are two of these stands with eight weapons apiece making for a total of 16 (sometimes that San Diego State Math 3 course pays off). 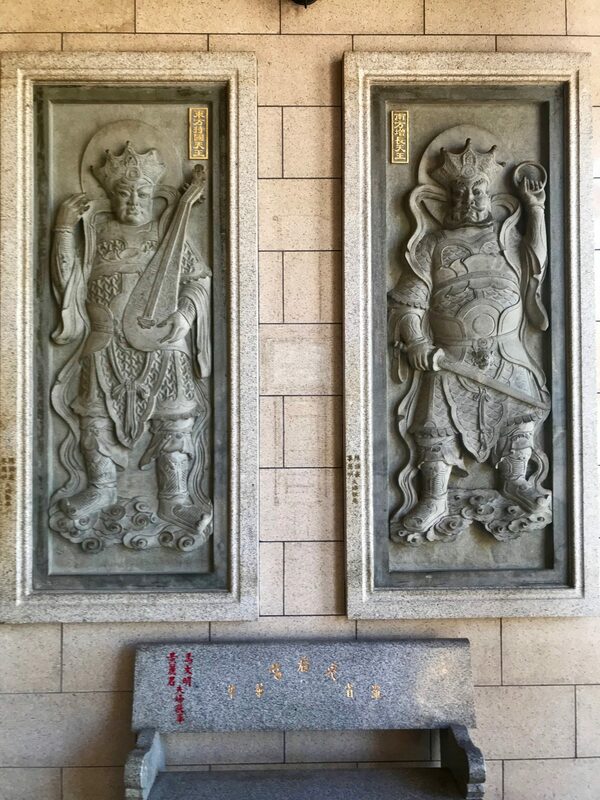 Michael told me they have something to do with the martial arts and that there actually should be a total of 18. 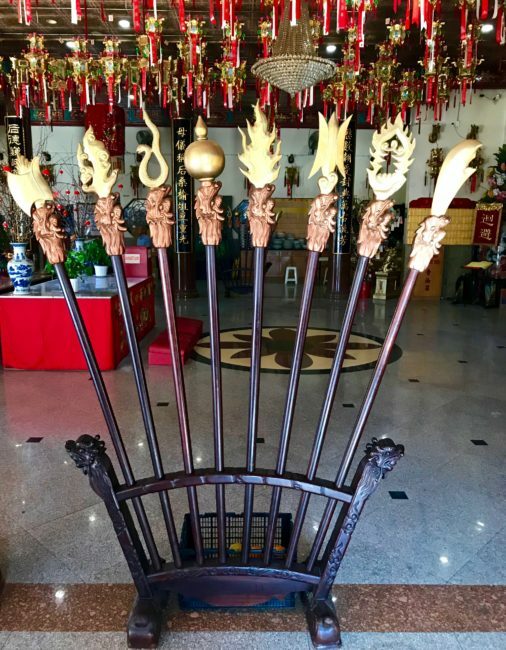 He didn’t know why each one was one short. 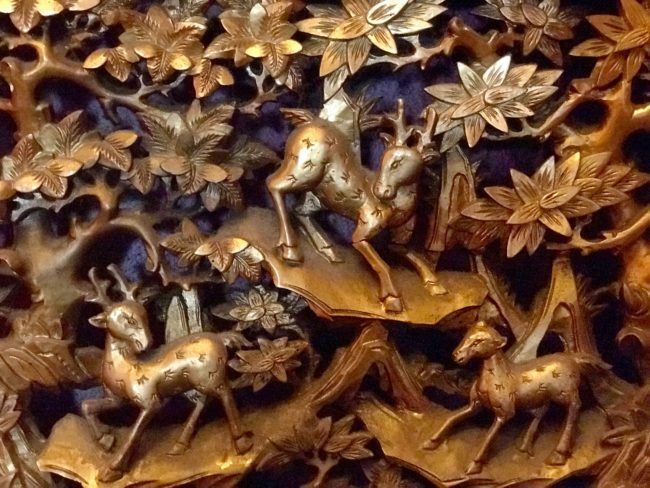 The temple also contains a large collection of miniature Mazus, which are made by different persons who leave them here as gifts. …and outside were colorful, as well. 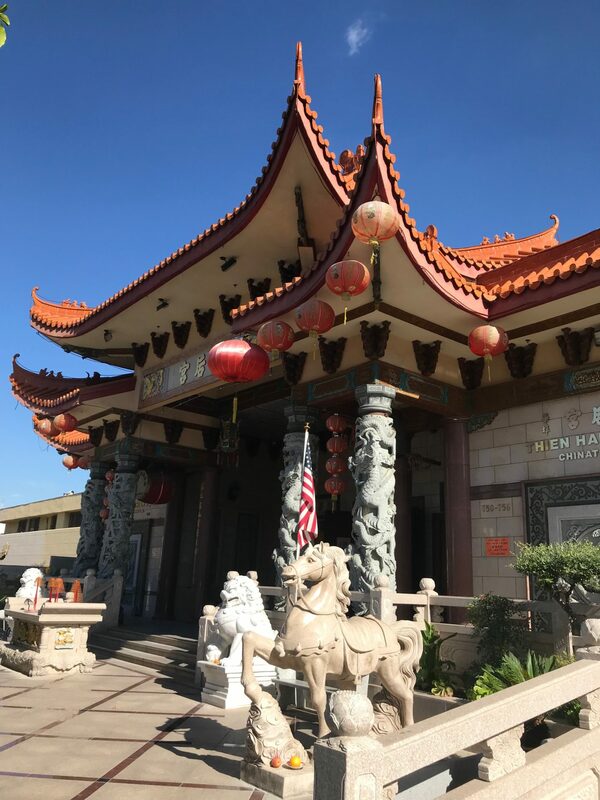 Unfortunately I had to leave, but as I exited Michael invited me back for future visit. 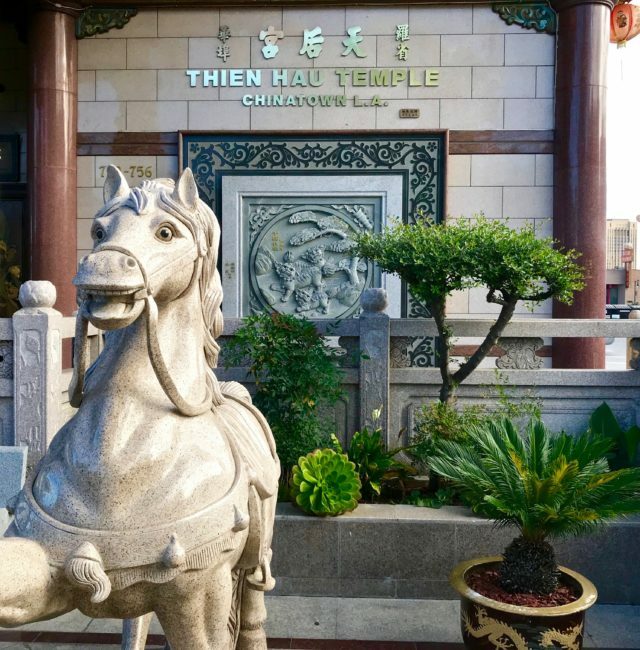 Knowing there was something I missed, two days later I was back at Thien Hau Temple, and so was Michael. 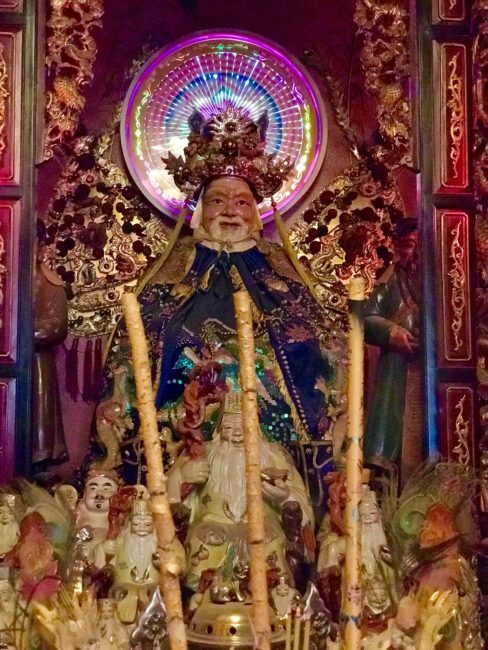 I started to ask him questions, but he explained that instead of answering, I should experience the temple as it was meant to be. 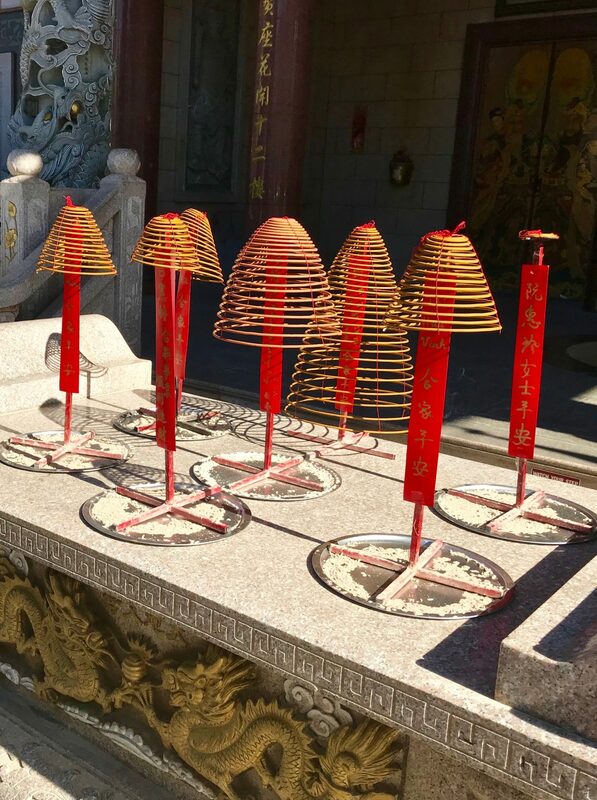 This meant praying at or meditating at each of the 11 altars (at that point I hadn’t known there were 11 altars). 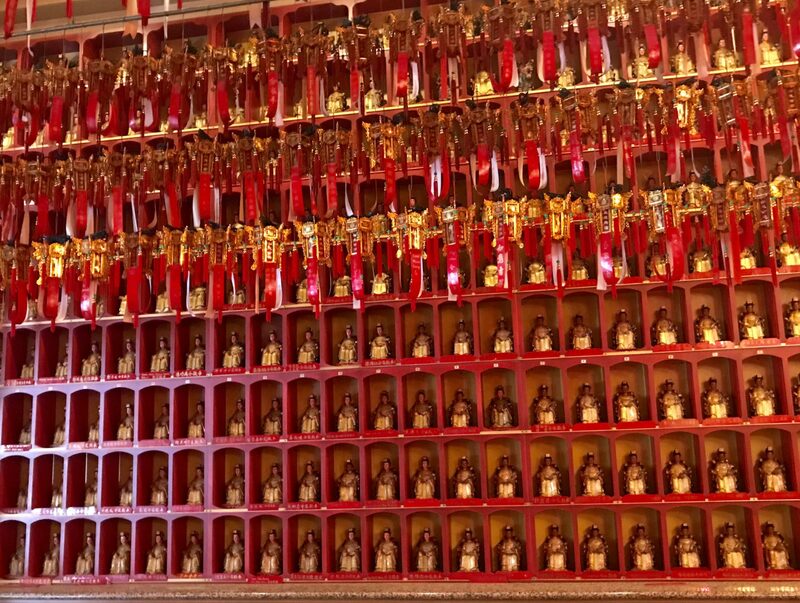 To get my bearings straight, Michael took me on a quick tour of the 11 and then over to where I was literally going to “stop and smell the incense.” It was time for me to get my tau on. 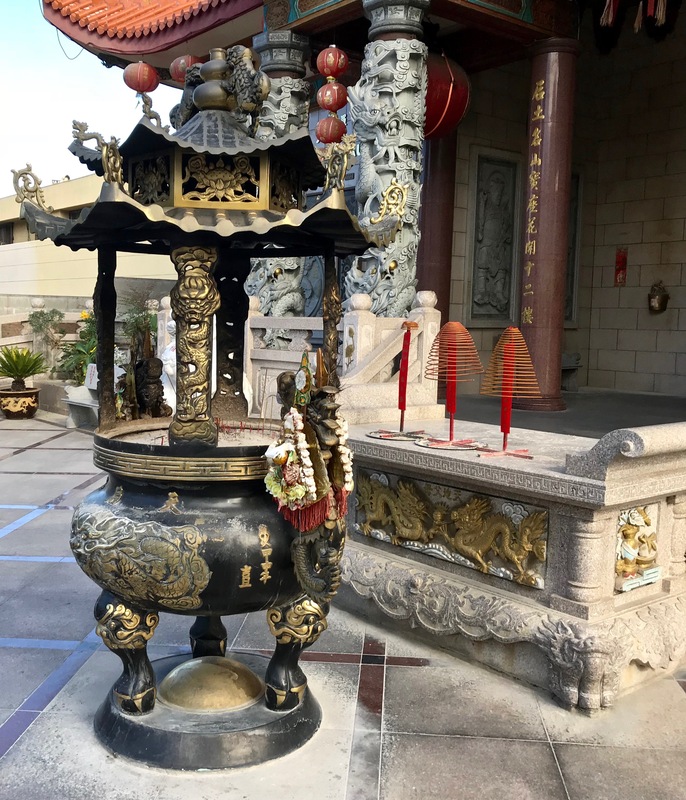 Back outside in front of the temple, I found myself at the altar where I first spied the woman a couple of days earlier. 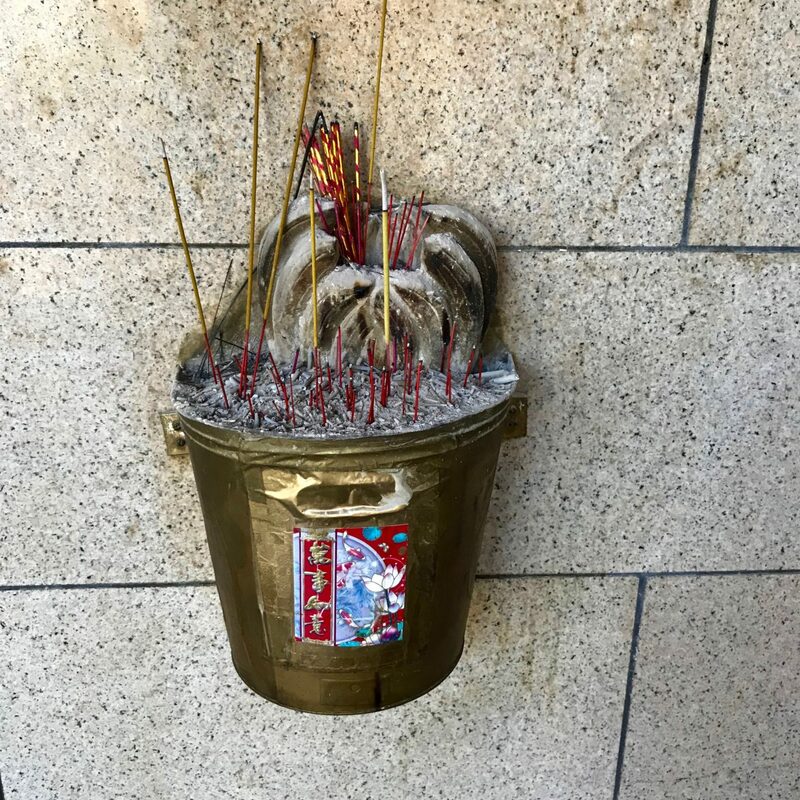 The incense lit here is said to go “directly to the sky.” I said a quick prayer that I wouldn’t burn down the temple with my remaining sticks of incense. 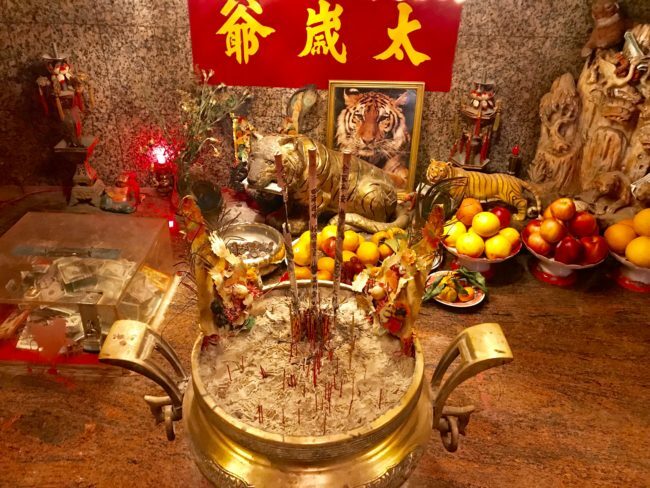 Altar #4 is the one for Mazu. In this area, there are many beautiful pieces to stop and admire. 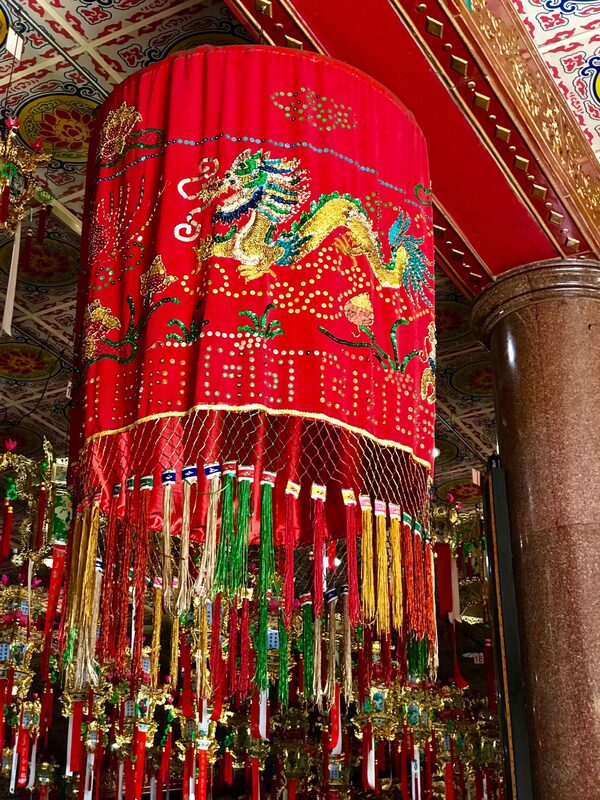 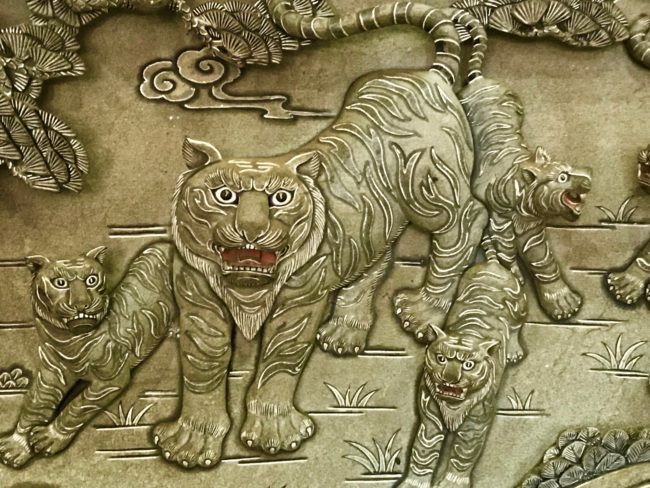 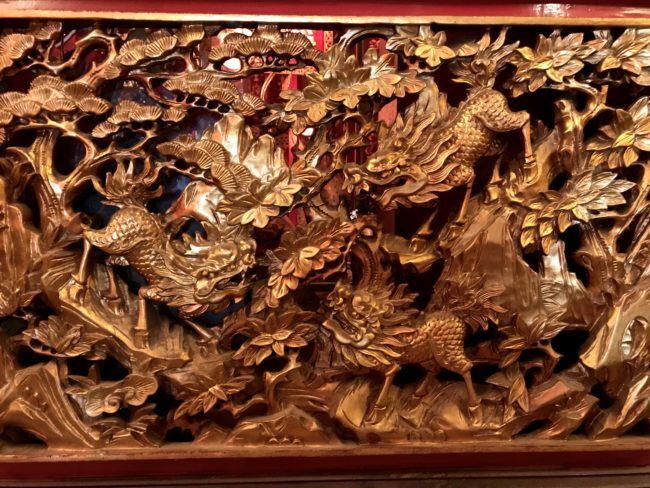 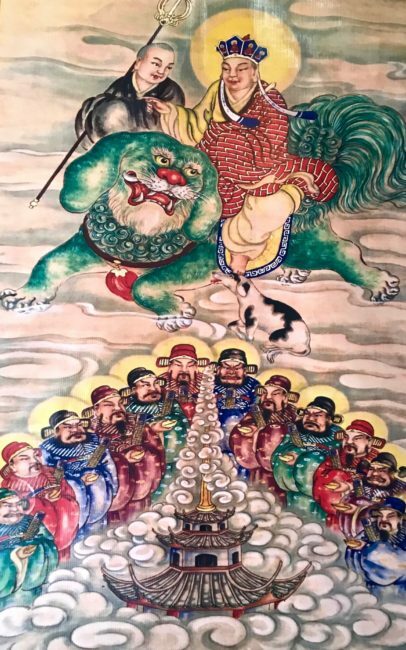 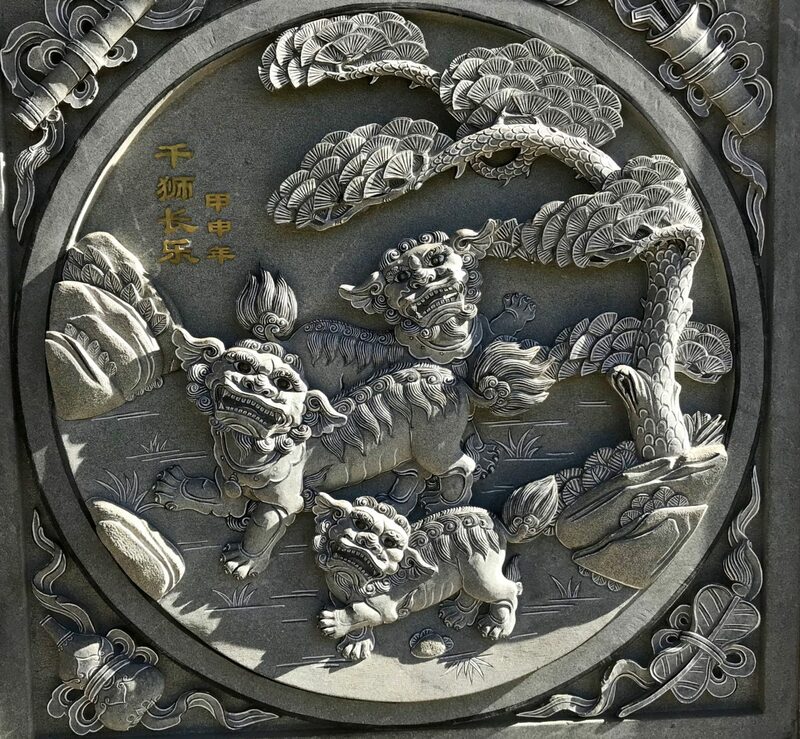 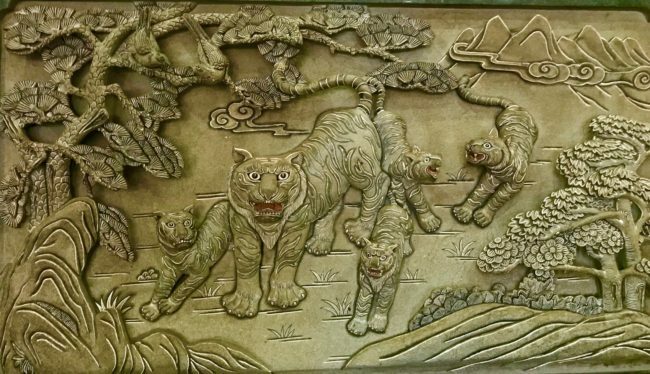 Directly underneath Mazu and her gifts is the seventh altar, which has a tiger. Michael told me tigers, elephants and dragons are important in the Asian culture. 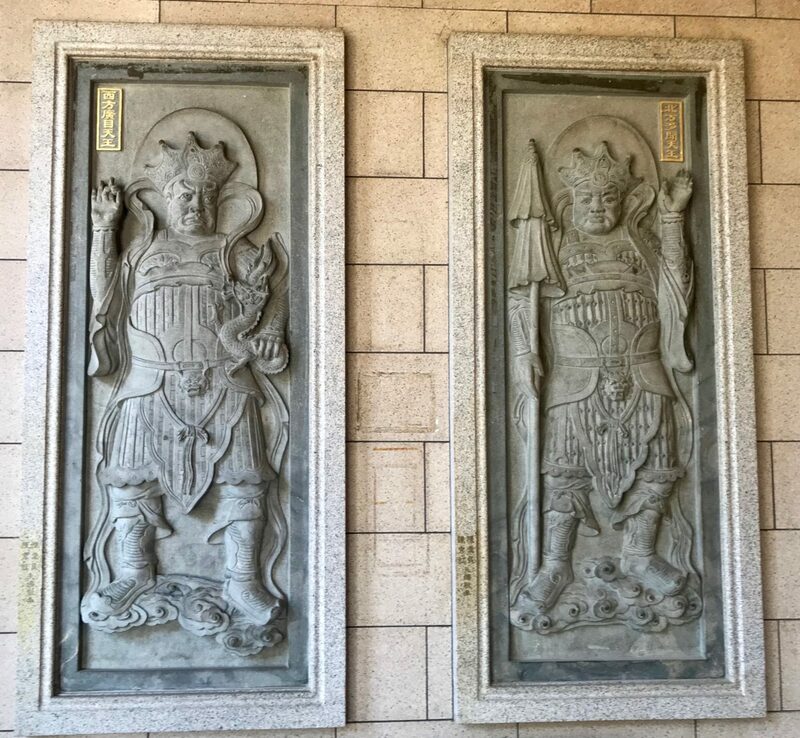 Speaking of which, I had seen this as I toured the temple earlier. Now it made more sense. 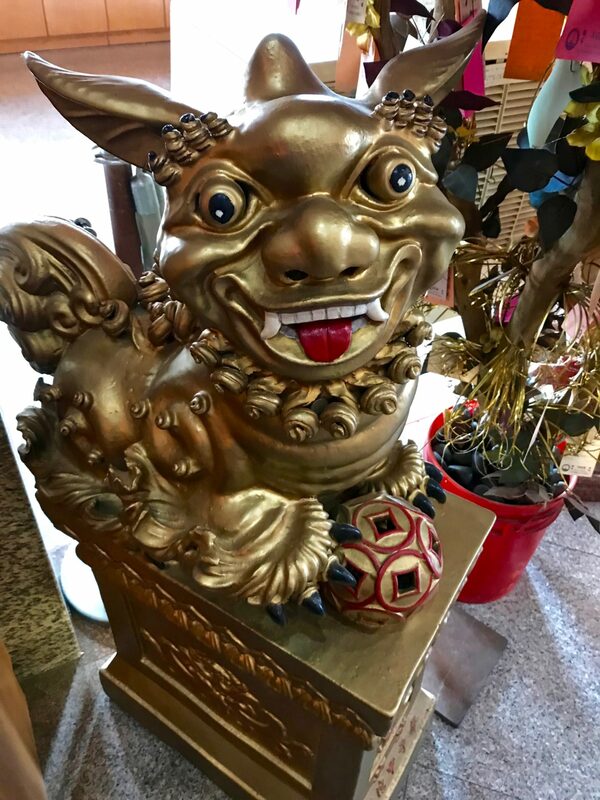 I then moved to a room I hadn’t even seen on my first visit here, first passing by this smiling face. 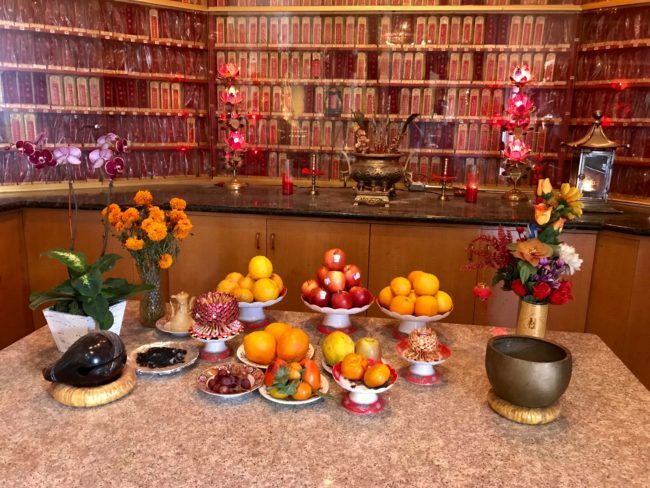 The next altar is dedicated the god of compassion. 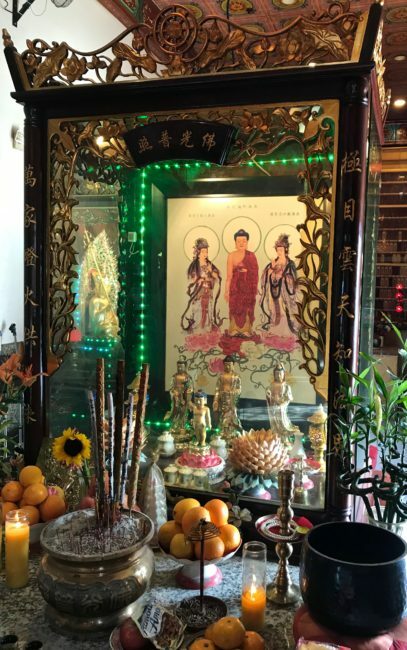 Michael explained to me on our altar run-through that this altar and the following one were dedicated to Buddha, although this is not a Buddhist temple. 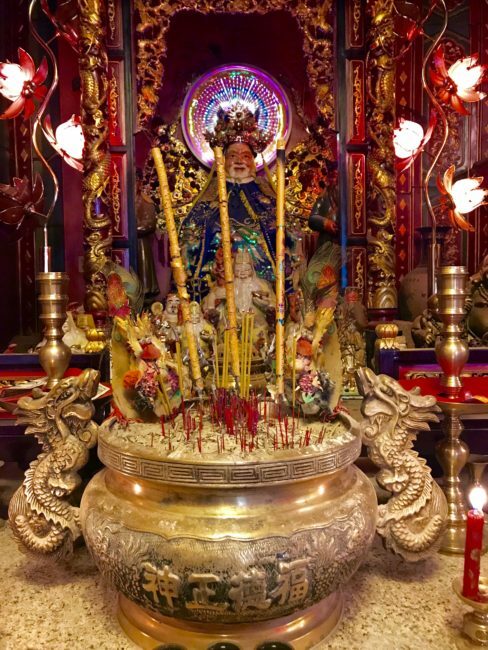 Altar #9 is dedicated to Dizang, a Bodhisattva from the Buddhist faith. 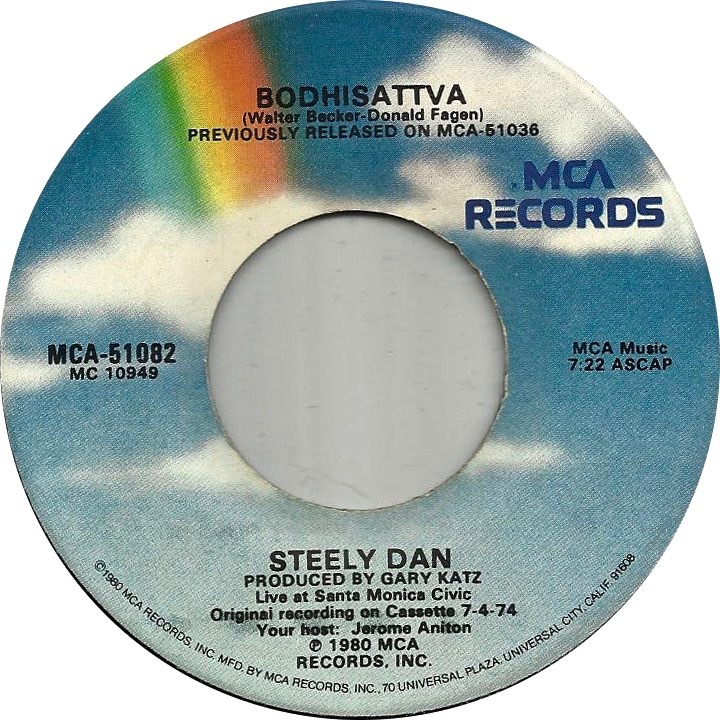 I refrained from singing the Steely Dan song. 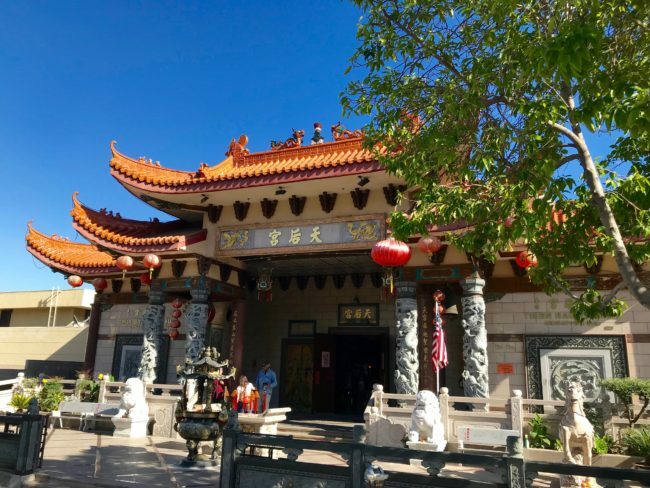 Afterward, I chatted with Michael a bit more and he told me that people from all over the world come to experience Thien Hau Temple. Although this is where numerous Chinese, Thai and Vietnamese people come to worship, Michael added that people from all denominations visit what he calls “this sacred space” and that “all are welcome.” He said people stop by and offer items such as fruit and flowers. 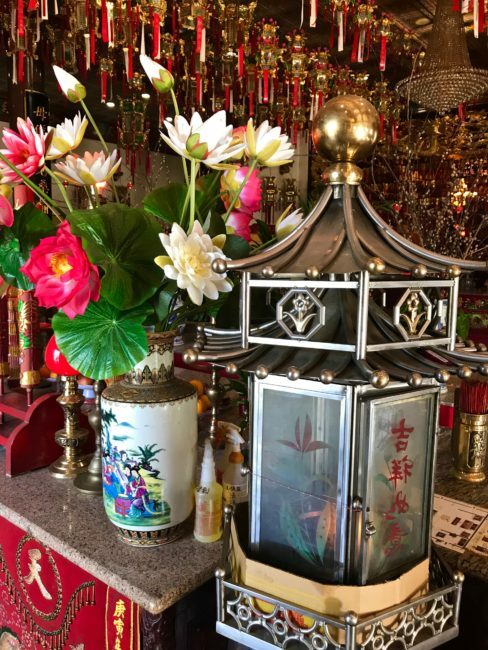 Others stop by just to experience the beauty. On both occasions that I stopped in, persons walked in to meditate and take in the peaceful aura that the temple provides. 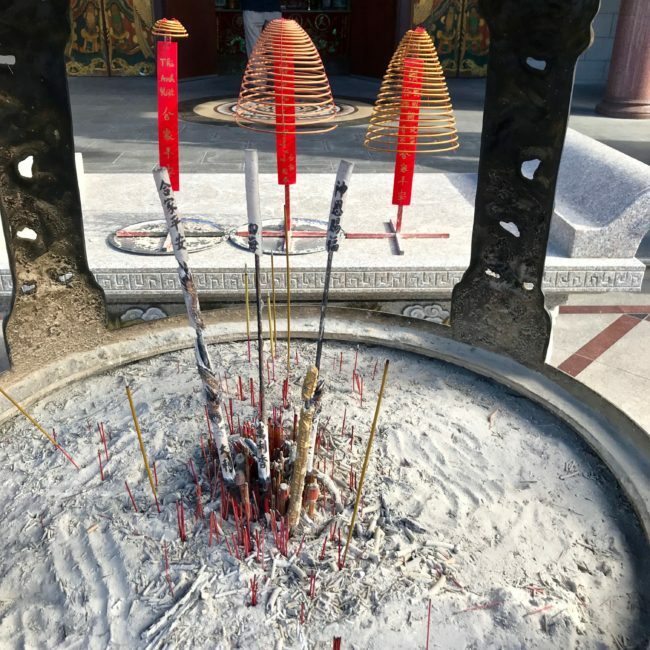 Visiting the temple is free, however donations are appreciated. 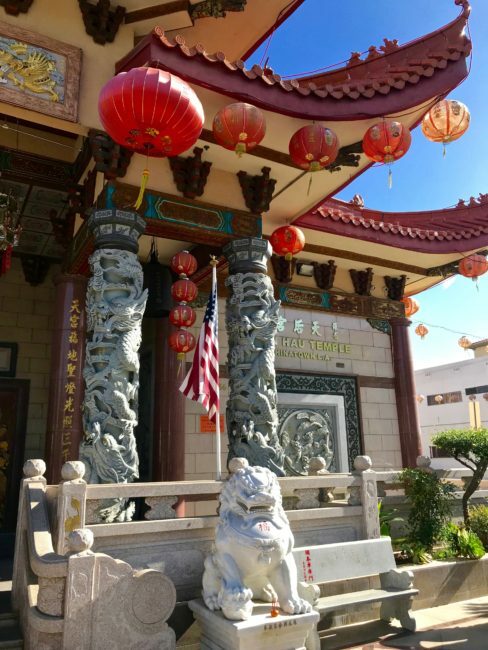 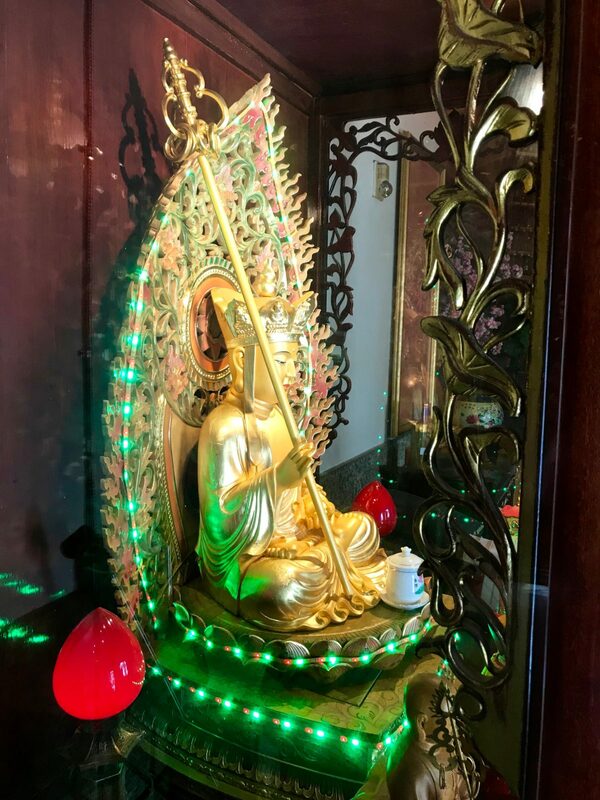 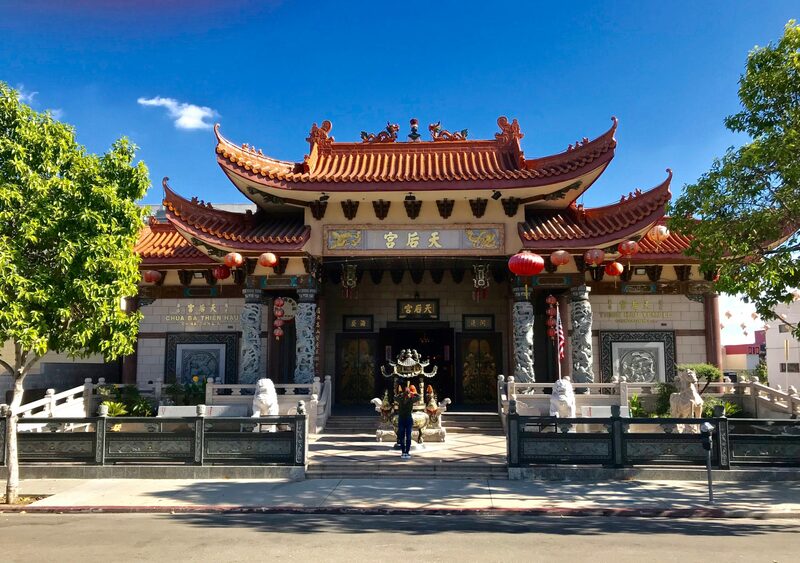 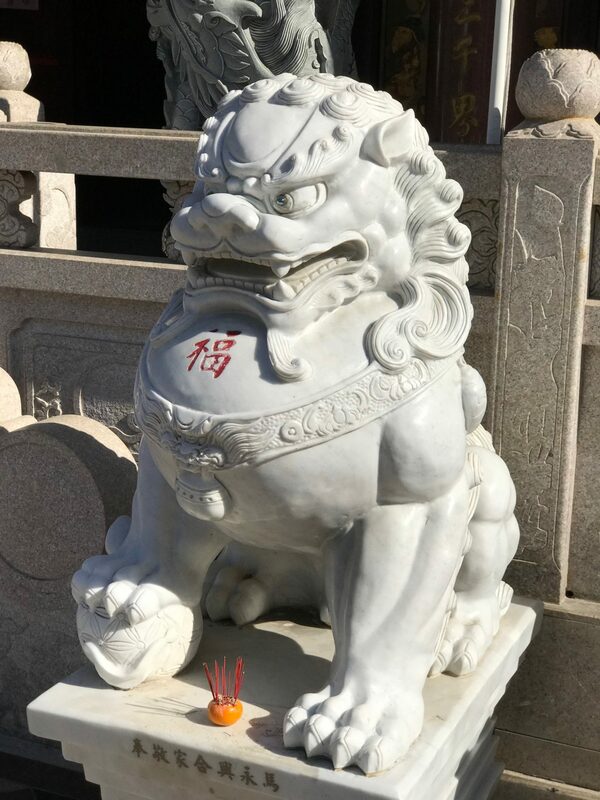 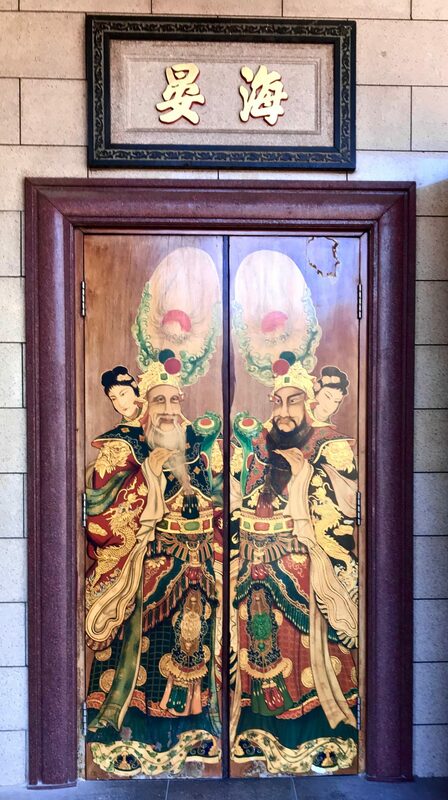 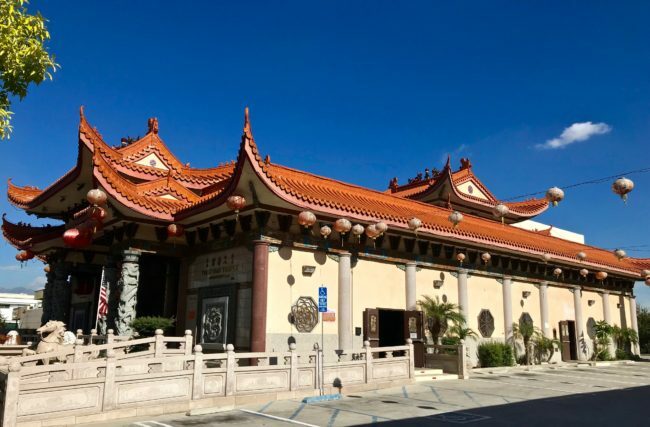 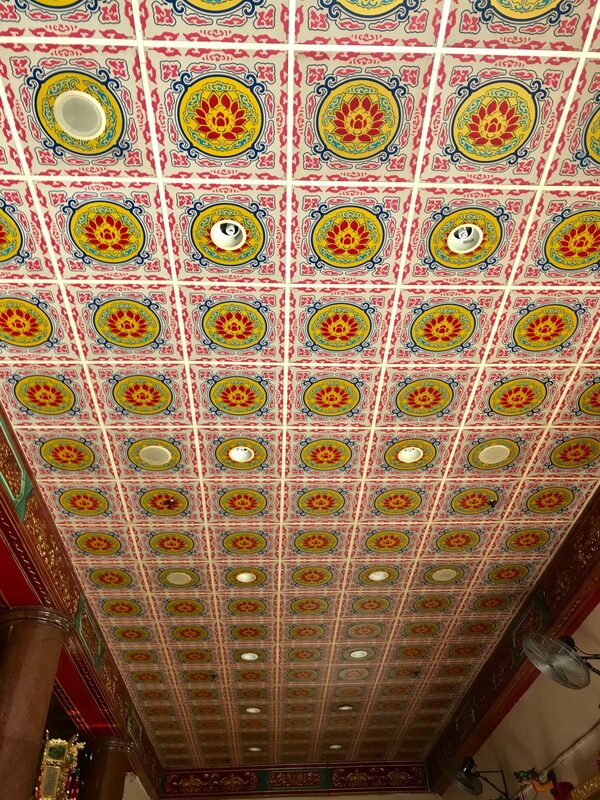 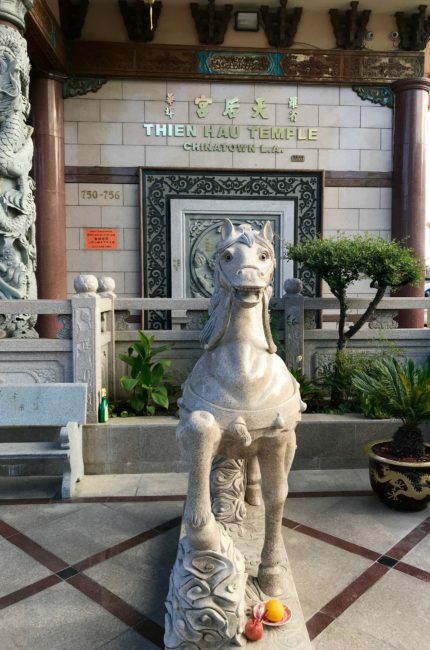 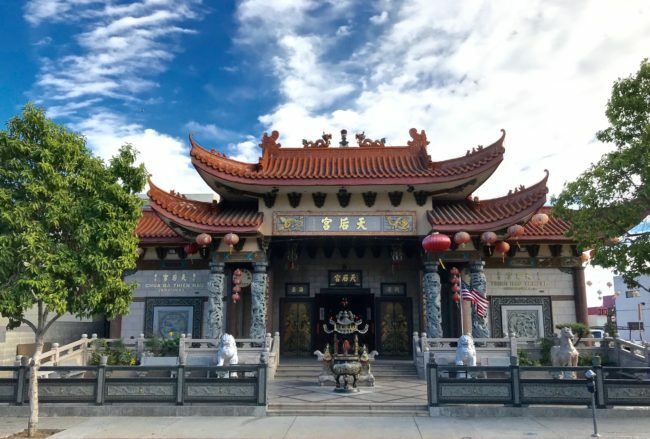 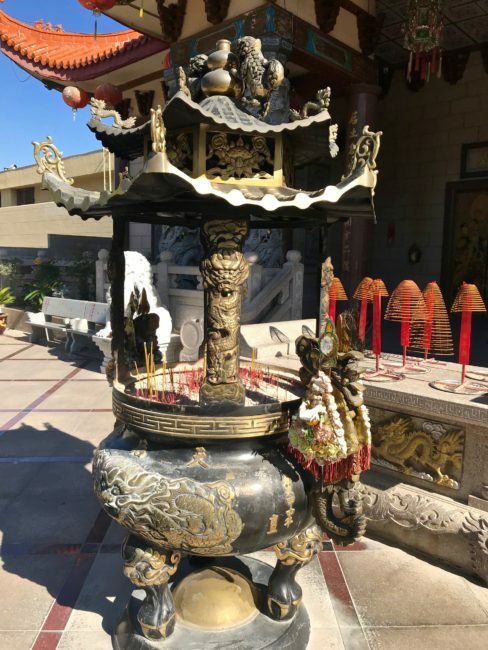 If you happen to be in Chinatown and need a peaceful respite, Thien Hau Temple just might be your perfect oasis to escape that hectic life for a little while, and hopefully you can keep your harmonious and positive consciousness as you attempt to navigate the Los Angeles traffic on your way back home.